Mike had kindly offered to pick up myself and a fellow new member, James, at Greenwich station. After a one hour and twenty min drive, we had just about reached our destination, but having made this journey countless times, Mike still managed to miss the entrance to Martin’s driveway (“again” he admitted) but bless him, its was understandable as the recent strong winds had blown the road sign away and there are no street lights where Martin lives. One quick double back, though and we were comfortably parked up in the drive way, albeit not without Mike taking advantage of his passengers’ newbie status, scaring us with “I have to make sure I dont drive into the marsh, otherwise we will sink without trace due to the recent downpour excess”…uh huh, thanks for that enhanced thrill, Mike, we’ll find a way to get you back one day! We were the first guests to arrive followed shortly by Annabel, the two Chris’s and Rupert. The night was remarkably still and not a cloud in sight for the duration of our 3 hour stay …I’ll say it again, not a cloud in sight. Sorry, its not often we get to say that, so I thought I make the most of it. The first thing that obviously struck those of us Londoners who don’t get out of there much was “where the hell did all these stars come from?”. 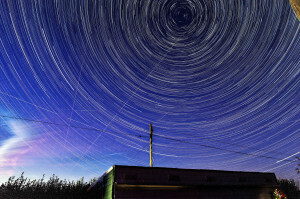 The sky was ablaze with starlight whilst Martin’s home basks in the secluded darkness of Romney Marsh. Surely, even Chris Lintott and Co would be jealous. The Milky Way was visible, though not quite as prominent as it normally is on other clear nights according to Martin, but nevertheless, still a treat for us star starved Londoners. However, according to our host and Mike, seeing conditions weren’t actually great due to the very moist atmosphere. Well, myself and fellow guests would never have guessed and it made no difference to us as despite the complete absence of wind, we were still blown away by the views through Martin’s amazing 14″ Meade Cassegrain telescope, a scope he has owned for ten years housed in a specially built observatory shed complete with a nifty sliding roof revealing the dark skies. Impressive. With that, he treated us to a breathtaking cosmic feast of galaxies, nebulas, double stars, globular clusters and Jupiter, while his lovely wife, Jane, had provided us with hot beverages to wash those ancient light protons down. First up on our cosmic journey was the glorious view of Jupiter and its Galilean moons. The two dark bands were very prominent, with a distinct swirling disturbance observable in one of the bands. One of the moons was about to enter transit but we needed to wait a while to see the shadow transit itself and also for Jupiter’s great red spot to appear. So in the meantime, Martin effortlessly commandeered the scope towards the M82 “Cigar” galaxy. A stunning view. This is also the home galaxy of the recent Supernova that occured this year and sure enough, we could clearly see the bright white spot near the edge of the galaxy still outshining the rest of it, though much of its luminosity had disspitated by then, it was still an impressive looking event to witness from so far far away. Next stop, the Orion Nebula. Again, a breathtaking sight as we could clearly see the famous shape and formation of the nebulosity, spanning the whole eyepiece with a few justified “wow”s coming from the other guests. 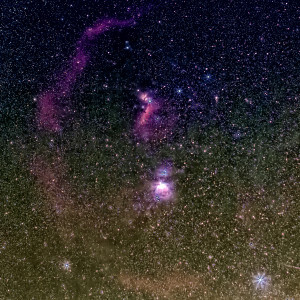 The “trapezium” of new born stars shining like the baby jewels they are. This was the best view of the Orion Nebula I have seen yet. Mike was in fact outside, spending much of the time imaging this beauty. Then suddenly, the telescope power switched off mysteriously. Naturally, I was the one at the eyepiece when it happened. I panicked, what did I do? But Martin reassured me I had done nothing and with supreme calm and confidence, he assured everyone that he will have it back on in a jiffy. Sure enough, in just a couple of minutes he powered it back on, realigned using the built in GPS which just needed a confirmed polar and one star alignment as it automatically swung to each alignning star. Clever technology. Hmm, did he say this was ten years old or tens years from the future? I suspect a time machine hiding underneath those floorboards. Martin then tested our knowledge to name some stars and to point them out. As I could only spot Martin and Mike in my immediate vicinity, I had to look above me to point out some more stars. I was quite proud to name a few, though less so when I realised I was pointing in the completely wrong direction with most of them. But that was the idea of our host’s fun test. Right from the start and throughout the evening, he educated us in a warm assuring way on the characteristics and features of each object we viewed, the star names, constellations and Messiers and how to locate them. We have certainly learnt a great deal from him, that night. And so our journey continued onwards to several more galaxies, nebulas and globular clusters. Its an overwhelming feeling to see galaxies so distinctly which are so incomprehensively distant (some around tens of millions of light years away) that even Science Fiction authors cannot fictionalise a way for mankind to ever reach. Captain Kirk and his Enterprise can’t even reach the other end of our own galaxy, much less another one. But there we were, swimming through them with Martin’s magic telescope. The face-on spiral galaxy of M81 (neighbour to M82), M51 (Whirlpool) galaxy, and several more. We also viewed a couple of beautiful globular clusters (spherical cluster of stars that orbit our galaxy), including the popular M13 Hercules. We then made a penultimate stop at the fascinating planetary nebula, known as the Owl Nebula. At the centre of it, we could see the white dot spec, the white dwarf star that created the circular nursery for its future children stars. Amazing to see these different phases of Messiers. This wasn’t just a tour around the stars, it was a journey through the cycle of cosmic life as we witness births, deaths, even afterlife. We saw it all that evening, directly with our own eyes. During this time, Mars had risen over the horizon, across the marshland. As if being directed by a photograper for Vogue, it had positioned itself seductively next to Martin’s garden tree. It was out of angular range for Martin’s telescope but no telescope or binos were needed to admire our beloved and much fantasised neighbouring planet. A distinctly reddish sphere flaunting itself then finally drifting behind the garden tree. We made one final stop with the telescope, a return trip back to our big brother planet, Jupiter. A fitting finale, it was too. The Great Red Spot had came into view, there was a pinkish tint to it and an unmistakable bulge. I have seen Jupiter many times through smaller telescopes but I could never make out this infamous storm, so it was a great feeling to see it for the first time here with this marvelous telescope. It was approaching 11pm now and so it was time to leave and return to our not so enviable sodium-light-filled London skies. A huge thank you to Martin and Jane for their wonderful hospitality, generosity and knowledge, sharing their most enviable dark skies and their cosmic spaceship. It was a most memorable evening for everyone who visited that evening. I most highly recommend members to take advantage of any opportunities for future planned Flamsteed visits to Romney. Saturday night saw the clouds clear and present us with a good clear night for our Romney observing event. As ever, Martin and Jane were impeccable hosts and treated us to excellent views of many objects that were interrupted only by tea and chocolates! Aside from brilliant Jupiter (and at the very end of the evening, Mars) we were able to view many faint objects that are normally either very difficult or impossible to see through London’s glare. Among these were M81 and M82, the Supernova still being clearly visible in M82. We also enjoyed M51, the Whirlpool, NGC 4565, The Owl Nebula, M35, M3 plus many more in the dark and clear skies that Martin and Jane kindly shared with us. There were a few ‘newbies’ to the Romney skies and we hope that they enjoyed the spectacle and won’t be too disappointed the next time we congregate on Blackheath! 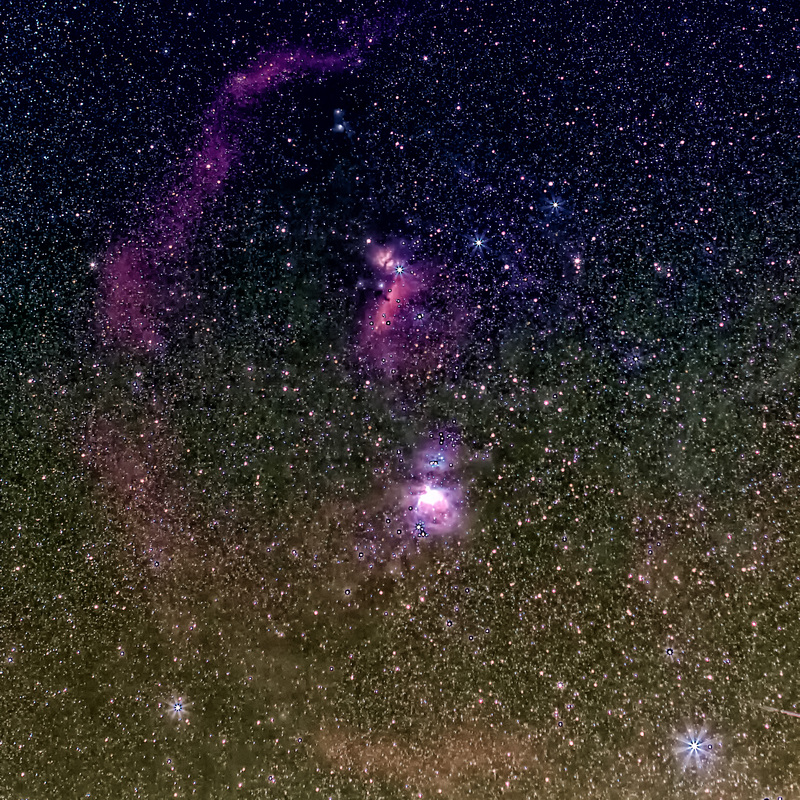 While under the myriad of stars Mike took the opportunity to image Orion with his H-Alpha sensitive camera to reveal the great Barnard’s Loop to the left of the constellation. You can see the image at the top of this report. So all in all a terrific night and great to see the night sky again, as I had almost forgotten what it looked like and looking forward to the next one! Clear Skies until next time.